Welcome to Passaic River Parkway, one of the three “emerald necklaces” in the Union County Parks System envisioned by the famous Olmsted Brothers landscape architectural firm that designed the parks system in the 1920s. The design created major parks like Warinanco, Nomahegan and Cedar Brook, along with links, wherever possible, utilizing the three rivers that course through the County. On the Passaic River, with the acquisition of more than 400 acres along the river in the 1960s, and parcels since then, the vision for the Passaic River Parkway is slowly becoming a reality. (UC Parks is also working with the National Parks Service to expand boating on the river as part of the Passaic River Blueway project. With less than 20 percent of the property bordering the river privately owned, it’s been possible to develop more trails for visitors to explore. The 2011 Bio-Blitz identified 652 species in the PRP, including: 241 plants; 69 fungi;11 bryophytes (small, herbaceous plants); 258 insects; 9 aquatic insects; 8 reptiles & amphibians; 6 fish and 9 mammals. (ucnj.org/bio-blitz) This section of the park also includes a wildflower meadow, bird boxes, a canoe launch, a bird blind and a deer enclosure. The trail highlighted on this map was developed in a joint effort between Union County and the Berkeley Heights Environmental Commission. More trails are being created through volunteer projects, with the hope that one day visitors will enjoy an uninterrupted 8+mile walk along one of the most scenic paths in this region. In Spring ’14, several Eagle Scout projects improved paths in the Summit area. 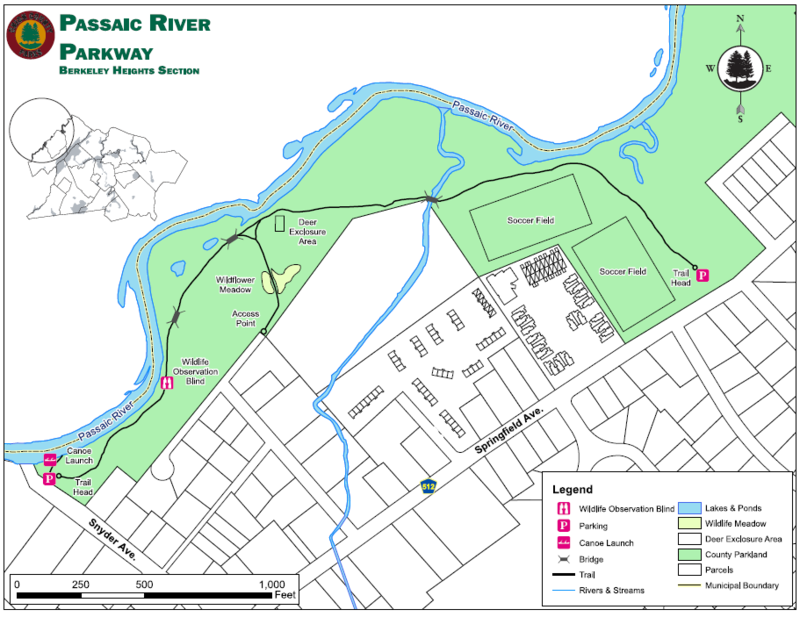 If you would like to organize a volunteer group to work on continuing the completion of the Passaic River Trail, please call UC Parks @ 908-527-4900.